Meet Nellie Belle, a loveable pup who has fun, fun, fun everywhere she goes in this picture book from the author of Baby Bedtime and Yoo-Hoo, Ladybug! On the beach, in the yard, even in the park in the dark—Nellie Belle always has fun. But what’s the most fun of all? Why snuggling in bed with her best friend Ted, of course! With terrific rhyme, sweet characters, and a cozy ending, this picture book from Mem Fox is just right for reading aloud to little ones. And illustrator Mike Austin’s darling dog makes it especially irresistible! Mem Fox is one amazing lady. Her first book, Possum Magic, was published in 1983, and here it is 2016 with Mem still creating books that are almost guaranteed to become children’s classics. Nellie Belle is written in a simple, clear rhythm and rhyme that small children will instantly respond to, with repetition that will help them memorise the text. Nellie Belle is a bouncy dog who likes to get out and about, having the sorts of adventures children know dogs love. A night time encounter with possums however, makes Nellie Belle realise she would rather be home with dear old Ted. Austin’s background as a graphic designer is evident in his work in Nellie Belle. I loved the strong colours, the texture, the animals’ expressions and the energy leaping out of each page. He cleverly adds many humorous details in the sub text, giving children details to marvel over and share with each other. 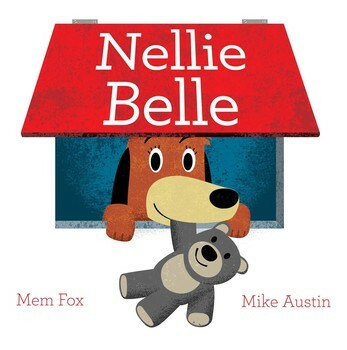 Nellie Belle, both the dog herself and the book, is sure to win children’s hearts.